The sunshine had well and truly deserted York by the final day of The Little Festival but that hadn’t stopped the Saturday shoppers from packing the marquee. Whether they were there primarily for the music or the beer and champagne is debatable but each of the artistes I saw got a very good reception from them. Technical issues before James Gillespie’s set meant that he wasn’t able to use his second microphone and loop station and that his act, by his own admission would be “raw” and a little weird for him. He opened with a Bluesy number in which his vocals were incredibly clear above the chatter of the crowd before moving on to Control, which still had a hint of Blues to the music but included some fast paced vocals that seemed not only to be tongue-twisting but possibly verging on jaw-breaking and had a slight Spanish tone to them, probably something to do with the fact that the song had been written while he was living on the Canary Islands. A cover of Johnny Cash’s Ring Of Fire was great fun, slightly over the top deep vocals mixed with vocally-produced trumpet solos. With his daughter in the audience, James next performed You Will Be Loved, a song written for her which, again in a fun way, depicted the worries and responsibilities of a new parent and was delivered in a manner as though he was singing directly to her. It was an “aww” moment for the crowd but, while I’m sure his daughter enjoyed it, she seemed more interested in the balloon she had lost in the marquee’s roof. Most of James’ set seemed to flow around his fun (there’s that word again) personality. Even when he admitted being a bit lost in the middle of No Cause, where he would normally add in a bit of beatbox, he laughingly tried to encourage Martin, the increasingly picked-on soundman, to add some from his desk. The shortened set ended with a cover which I vaguely recognised although, once again, he put his own unique spin on it – more tongue-tying, start/stop vocals that (and this shows my age) brought to mind an image of Normal Collier singing a chart song. Next up was Laura Kindelan, a young singer/songwriter from York who I had heard good things about. Her bubbly personality was evident right from the start and she opened with a couple of covers – Alex Clare’s Too Close (I think) and Artic Monkeys’ Fluorescent Adolescent, a type of song which she admitted she doesn’t normally do but was incredibly relaxed while performing, not put off at all by and, in fact, laughing at one group of women in the audience who were enthusiastically shouting and whistling encouragement. Next Laura slowed the pace down with one of her own songs, a sad one which she explained was about a friend, saying that no matter how bad things get there is always something happy you can look to. A cover of The 1975’s Girls was dedicated with a smile to that still-enthusiastic group of women, who were also told, as Laura encouraged “lots of head-bobbing” during her rendition of Bill Withers’ Ain’t No Sunshine, that “you guys can just dance…” Another cover, this time The Beatles’ Blackbird, which she described as “a cute song” was followed by another original, one Laura suggested she doesn’t like playing because she finds it cringe-worthy and reminds her of a Facebook post she made when slightly younger, which she read out to illustrate. Admittedly the post may have induced a slight shudder, but the song was lovely and, from this listener’s point of view, not cringe-worthy at all. Increasing crowd noise led to two problems during the next song, which came from the recently released EP, Rise – I didn’t hear the title and, with her voice wavering slightly, Laura called for more vocals in her monitor before deciding to give up on the song. Those who were listening, however, wouldn’t let her, and she soldiered on brilliantly. Middle Of The Bed, also from the EP, followed, Laura’s guitar playing more complex than you would expect for somebody so young, and including occasional added guitar-body percussion. Then she hoped she wouldn’t mess up too badly during Sunshine Kid, an emotional, beautiful song. Admitting that Bring Me The Horizon scare her, she next produced an easy-listening version of their Can You Feel My Heart. Afterwards, her personality shone through once again as she spotted a man in the crowd wearing a birthday hat. Asking his name, she encouraged the crowd to sing Happy Birthday to him before finishing her set with another of her own songs and a cover of Niles Barkley’s Crazy. The whole set showcased a young lady with a lovely personality and a great voice who, on finishing, was treated to a much-deserved acknowledgement from the crowd. As The Rusty Pegs took to the stage I asked a friend who had seen them a couple of weeks earlier (at what had been said to be their last gig before lead vocalist Cat Foster had a baby – tonight we were encouraged to make no sudden loud noises and, hopefully, a mid-wife was on standby…) whether they were truly a Country band. His reply of, “not really” seemed to be belied by the fact that they opened with a rendition of Dolly Parton’s Jolene, a proper Country song if I’ve ever heard one. One of their own songs, Move, followed and, admittedly, had slightly less of a traditional Country music feel even with the addition of a banjo. Cat managed a small amount of dancing during the song, and some of the lyrics – “get ourselves out of here” – seemed to be amusingly appropriate, given her advanced pregnancy. The style was continued with the slower, mellower and very enjoyable Long Hard Road Out Of Love before Russ Thorne took over the vocals for a cover of Folsom Prison Blues. “This is the first time we’ve played this with a banjo,” Cat explained before Any Kind Of Home. You would never have known. Next up, a brilliant country-fied cover of The Killer’s Humans might have had you scratching your head wondering where you had heard the song before. Sadly, the band’s version of The Decemberists’ Don’t Carry It All was the last I heard from them – as entertaining as they were, I had a prior appointment which meant I had to leave the Little Festival at that point, missing the end of their set and, unfortunately, festival closers The Blueprints. These six days of free live music in the centre of York just fell nicely for me. I was not only able to get down to them all but, apart from on one day, I could get there for the beginning, meaning that, of the twenty-four acts who played, I only missed two. Many of the acts I saw were new to me and all I would quite happily watch again. Some, in fact, I will be keeping an eye out for. As well as showcasing musical talent, the aim of the festival was to raise money for York Against Cancer and, judging by the number of people who were dropping coins into the tins, I suspect a fair amount will be have been collected. (The final total hasn’t been announced yet, but the first three days raised over £400.) I have sung the praises of soundman Martin, who helped all the bands throughout the week sound superb, but special mention should also go to Ellen and her team of helpers, who made the festival go so smoothly. Roll on the next time. 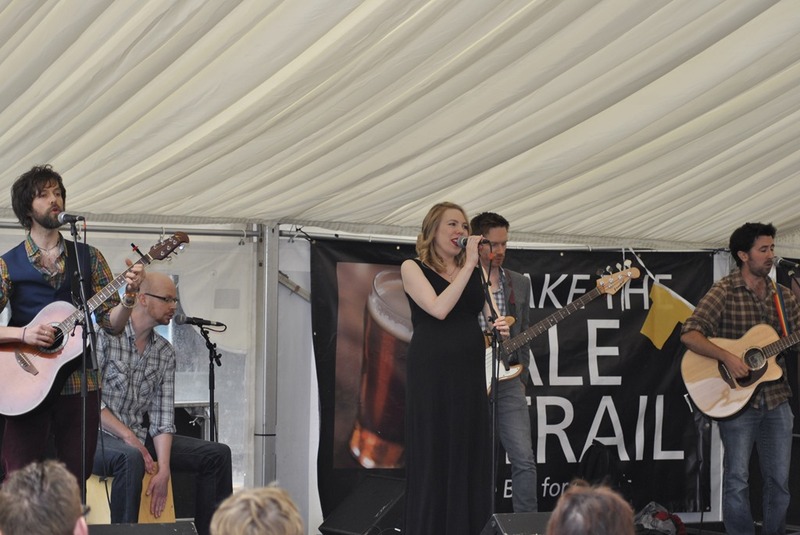 This entry was posted in Live Music and tagged James Gillespie, Laura Kindelan, The Rusty Pegs. Bookmark the permalink.